Does not need to be pre-washed – is already prepared ready for use. We do not sell this fabric as fat quarters. This bamboo fleece is ready-to-absorb and does not need to be pre-washed to activate its absorbency making it the perfect core for your cloth menstrual pads. Bamboo fleece is also used in nappies and for backing blankets and scarves, making sweatshirts and joggers or for lining hats and coats. 70% viscose bamboo, 30% organic cotton. Bamboo fabric is produced from the environmentally sustainable bamboo plant. Bamboo fleece has antibacterial properties and can even be worn by those who experience allergic reactions to other natural fibres such as wool or hemp. 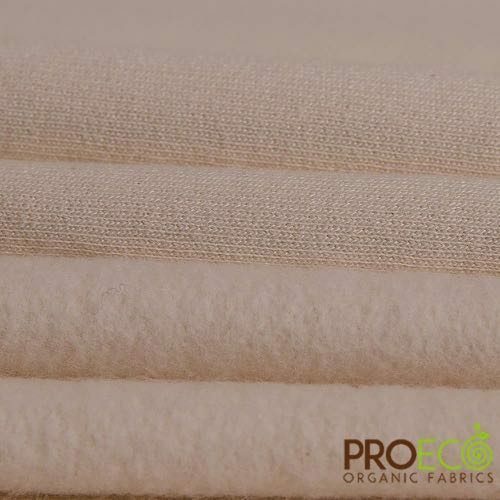 This bamboo fleece material is made with the finest high quality combed yarns for the best in softness, absorbency, and luster. It is pre-washed and preshrunk but as it is a stretch fabric some further shrinkage may still occur so it is preferable to wash and dry before cutting to size.